This Christmas I have decided to give the gift of homemade goodies to the chosen ones on my list. Either through homemade gifts I’ve created in the kitchen myself or by selecting small producers based in Ireland that really appreciate your custom! Jars of this Spiced Apple & Ginger Chutney makes the perfect gift alongside some cheese. For more edible Christmas gift ideas read my post here. I first made a batch of this apple and ginger chutney back in September. I was gifted a large glut of windfall apples from a Physiotherapy colleague and I didn’t know what to do with so many apples, I had my fill of apple tarts and crumbles. Chutney is a staple at home in Tipperary with my Mam normally the creator using apples, rhubarbs, pears or anything else that is in season. 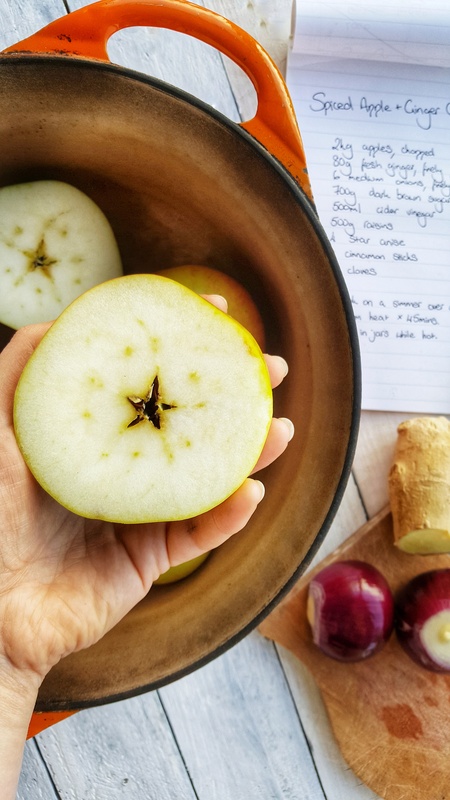 The first time I made chutney was last year whilst travelling in New Zealand – my first creation was a red onion and apple mix but I forgot to write down the recipe!! With some discussion with my Mam and a vague recollection of the New Zealand version this recipe came to be! The secret is to seal the jars while hot and the chutney will stay perfectly good for up to one year. Store in a dark, cool place and once opened, store in the fridge. The cloves, star anise and cinnamon are optional extras. Make sure to remove them at the end before storing. If you only have ground cinnamon, add 2 teaspoonfuls instead. To sterilise glass jars: simply wash with soapy water and allow to dry upside down in an oven at a low heat. Place all the ingredients in a large saucepan over a medium heat, stir and cover with the lid. Regularly stir the saucepan as it comes to a gentle simmer and continue to cook for 45 minutes. Remove the star anise, cinnamon sticks and cloves. Pour immediately into sterilised jars and seal while hot.